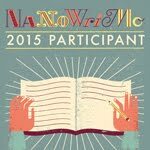 I'm participating in NaNoWriMo again! I'm working on the third in the series in my Legend of Trees series. As I am writing this, only the first book, Arbor Colony is out on Amazon and other online booksellers. The second book, "Seed or Stars" is in editing and will come out before Christmas 2018. And that leads to why I am writing the third in a series. I hope that isn't too confusing. I mean, ideally, I would finish and publish all the books in a series and have nothing still in the WIP phase so that I can start NaNoWriMo with a clean slate and nothing to distract me from it. But that is not going to happen without a lot more planning than I am able to do right now. So the third book has the working title of "Space Forest." One of the members in my critique group says I should call it "Trees in Space" but I think that sounds a bit too zany. These are not YA, and that would be a better title for them if that was the genre. But it's not. So it isn't. And I won't. Today is the first day. I have beaten my work target. And now I am celebrating a bit by writing this blog post. I will probably be posting again in a week to brag some more. Unless I am falling behind. In which case I should spend my time working on the novel.